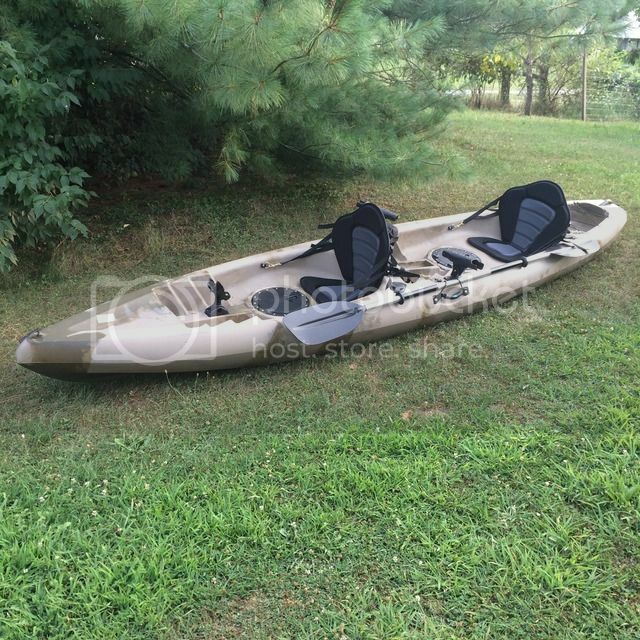 I've been looking at fishing kayaks and I luckily found a tandem one on an auction site that handles overstocks, customer returns and damaged products. The fact that it has no maker or model on it must have scared bidders as I stole it. Lots of features and great reviews once I figured out what it was(Useful uh-tk181). I can't wait to get it in the water but the manufacturer did not stamp a hull number on it which creates more hassles in Ohio as I will have to haul it to one of just a handful of Division of Watercraft offices in the state to have it inspected as if it were a home made vessel. Once I get that, I can get it registered to be legal. Looks like a heavy one.....need a fishing partner to help load it. What does it weigh approx.? What are round, black discs on the floor in front of seats? What does the manufacture say about no number to ID it? It is on the heavy side at 68 lbs. It is rated up to 450lbs The black disc are the hatch covers. One has a dry bag insert but the other one was missing. Plenty of storage room. I called the customer service and they are aware of the hull ID problem and are working to remedy it on their fall kayaks. The hull ID plate is probably an aluminum/stainless steel plate that is riveted/screwed on. Maybe they can/should send you one to affix to your water cruiser. How deep are your hatches, deep enough for a minnow/leech bucket? Finally got thru to the Watercraft Division. She told me that there are only 2 Useful brand kayaks registered in the entire state. The company has be made well aware that they are breaking federal law by not putting a hull ID on them. While they work out a resolution, I have an appt. next month for an inspection to get A number so I can register the yak. I am guessing the depth of the hatch is around 6" give or take a bit. You and Stumpjumper going to christen it up at the cabin lake? I doubt that we will take it. With me taking four of us up to the cabin, I may opt for a luggage container on top of the Caravan. There is a canoe and a small bass tender already up there. Fall colors should be coming in while we are up there. That is a weird law for ohio. here in florida we do not have to register anything that is not motor propelled. you can buy A yak straight from the shelf and take it to the water right away. If you use A trolling motor or some other motor you would have to register numbers for it. Anyway very nice and im sure you will enjoy it. "Looks sharp, glad you got such a good deal on it. RG will be envious "
I've gotten rid of a couple of my smaller boats(8' and 10' livingstons. I still have the 13' one and the 10 foot okoume Don Hill driftboat I built..too buried to dig out of the garage.A kayak?.I guess I could use one at the other house but I just haven't really done anything "waterwise" except haul out a surfboard once this year.I just haven't had the time.I could use a surf kayak (easier on the knees than surfboards)..but doubt you'd find one in the midwest. We only went for our second hike this year on Saturday..about 4 miles of pouring rain(8 Mile Creek)..and we didn't bother reaching our destination due to the conditions;slogging up a vertical "Sasquatch"(big steps and roots) made trail,views would have been fogged in,eating lunch in pouring rain..no thanks).The only other hike was to "Green Mountain Lookout"(google that in WA state)..about a 8.6 mile hike.My knees have just not been up to par for serious hiking lately.